It’s the Pro Challenge Series world. In reality, it is the basis of one of the best-looking, best-racing scaled-down cars in the country. “We think it is a pretty good looking product and they are pretty fast,” said Litzinger. “We run pretty much on 3/8- and 4/10-mile tracks. We run as big as half-mile tracks like Bristol Motor Speedway. Generally, they are within a second of Late Model cars. That demonstrates the speed they have. For young racers these days, there are plenty of options as to where to go racing. There are Legends and Bandolero cars from 600 Racing. There is the Allison Legacy Series. There are always WKA Karts and Quarter Midgets as well. But there is a relatively new series out there that is picking up steam and gaining some ground in the race to grab the young racer. But just like several other series, this form of racing isn’t just for the 12, 13 and 14 year olds looking to move on up. This is a series for anyone and everyone who loves racing and wants to do it affordably. The cars look sharp. And underneath, they are stout. The Pro oval version of the Pro Challenge Series cars have a ZX 1100cc Kawasaki four-cylinder, water-cooled power plant producing 140 horsepower (the road racing versions have ZX 1200cc and the ZZR 1200cc fuel injected engine that delivers 185 HP). The water-cooled engines are a major departure from the commonly used air cooled ones, and desirable for their durability and lower maintenance cost. The Pro Challenge cars might be small, but they are real racecars. different body styles, including Dodge, Pontiac, Ford and Chevrolet body styles. One of the more unique aspects is the fact that the Pro Challenge cars can also come with a truck body as well. “The truck bodies are different,” added Litzinger. “They were so good, people just wanted to get in them. The car bodies took a little longer to develop, so people got into the trucks first. We’ve really got a good mix of them now, though. Over the last couple of years, the Pro Challenge cars have taken off. They have garnered plenty of attention from sponsors and drivers alike. All of the tour races pay $500 to win. A minimum purse for each race is around $5,000. The Dream Series consisted of 12 races, with the best nine finishes counting toward the championship. 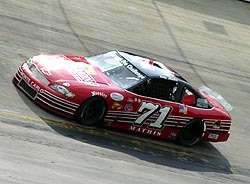 After all 12 races were over, Terry Mathis led the 59 different drivers that earned points in the Dream Series to earn the National Championship. Mathis is no youngster either. He’s been racing the cars for a while. But the series does focus on the youngsters. And the response has been great. Right now, there is a lot of interest in the series. Young Bandolero standouts Zach Stroupe and Darrell Wallace have both run a couple of races and plan to run more in the future. 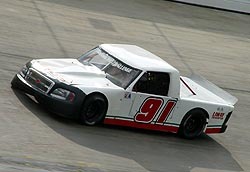 Legends standout Chrissy Wallace, daughter of NASCAR star Mike Wallace, has run a few races. Even Nick Pistone Racing, who is a mainstay in the Legends car world, now has a two-car team in the Pro Challenge Series. The series is a good place for young kids. “We have a lot of young guys, 12 and up, participating in the Pro Challenge cars, coming from Bandoleros and Legends,” said Litzinger. “In some cases, they come from karts. It provided a unique mix of old and young on the track. As it turned out, the old guy ended up winning the championship, but the young guys are coming on strong. 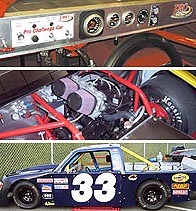 The Pro Challenge racecars can carry both truck and car bodies. “We don’t have an age requirement for our series. We pretty much leave it up to the tracks. I don’t think we have anyone younger than 12 running. We are pretty much open to the track rules. Like at Bristol; their rules are 16 years or older. That is why we couldn’t have a points race there, because some of our points runners are under 16. And the names aren’t just there now. In fact, the series has already had plenty of successful graduates. full-time in the Pro Cup Series currently, and all indications are that Brett will move up to the series full-time in 2006. The series has an exciting future. Things will likely change with the National Series in 2006, as the series looks to minimize traveling costs. “Hopefully next year, we’ll have some new tracks. We don’t have the schedule set, but we are looking at touring as much as we can with the UARA Late Model guys. Our national program will probably have a little different approach. Where else can you race at Bristol Motor Speedway on a budget like this? 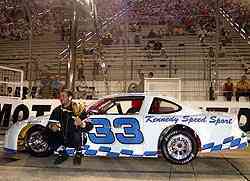 Just ask this year's Bristol race winner, Jason Burchard.